As I mentioned in my last post, I really like my Miller Digital Elite welding helmet for its responsive auto-darkening, the quality and the comfort–and of course the tricked out paint job by Pete “Hot Dog” Finlan. But your application and budget may dictate a different choice in welding helmet. A while back I put together this white paper on Selecting a Welding Helmet (.pdf) which includes information on fixed versus variable filtration, auto-darkening versus flip-up welding helmets, and which filter shades you need for which welding application. I know a good welding helmet is a big investment. You’ll want to do everything you can to protect your welding helmet so your helmet can continue to protect you. You should have replacement batteries on hand–the last thing you want to do is end up out on a job with a helmet that won’t darken automatically. The front lens cover of your welding helmet is another common replacement part you’ll want to have on hand. This is what take the most ‘abuse’ when the helmet is in use. Usually sold in packs of 5. For the grunge factor alone, you should consider some replacement sweat bands (Arc-Zone carries some nice ones sold in packs of 2 from the folks at Revco). These are good to have if you’re welding in out in the field, in the heat. 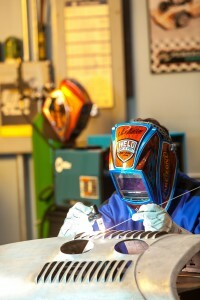 And if you ARE welding out in the heat, check out the health tips on dealing with heat stress from our friends at CarmenElectrode.com. Be sure you carry your helmet in a helmet bag. It doesn’t need to be anything fancy, but should at a minimum protect your helmet–especially the lens– from getting scratched. If you DO want something a bit more rugged, then you should check out this bitchen’ backpack (pictured, right). 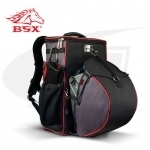 It’s from the folks at BSX–not only stylish, but a practical way to carry your tools, your helmet, and even your lunch to your welding job site. Whichever route you go, do be sure to always use eye protection: goggles, safety glasses, or welding helmets. And turning your head away (I know, I’ve seen you do it) won’t adequately protect your eyes from arc flash–damage from arc flash can accumulate over time. You may want to download this Guide to Eye Care for Welders (.pdf), print it out and keep it in your shop. There’s a section on what to do in an emergency that I hope you never use, but should be easy to find if you ever find yourself in an emergency…. Not really a “protecting your eyes” tip as much as it is a “protecting your diginity” tip, but if you’re a more “experienced” welder consider cheater lenses from your welding helmet. Arc-Zone carries them for for both Miller welding helmets (along with replacement parts from inside lens covers to batteries) and for the Jackson/ Hunstman line of helmets (for which we also offer replacement parts). As always, good welding! and stay safe! wow very impressive safe tricks helps me a lot. these things must kept in mind while welding and must see welding related products it will helps a lot.